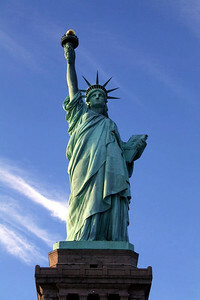 October 24 - November 14, 2009 / New York, NY -- We are at one of the highlights of this trip. New York is such a high energy location and vastly different than our normal routine. My office is located in the heart of Midtown Manhattan on the 25th floor of the 88 year old Paramount Building in Times Square. I commute to work from our RV park in Jersey City by walking six blocks to the PATH station. The 33rd street train takes me ten blocks from the office. It's a short walk to the MTA subway for the 2 minute ride to 42nd Street. Then it's only one more city block to our lobby. Tomorrow, October 31 is Joe's birthday. We are going to have dinner at Sardi's Restaurant followed by seeing the Phantom of the Opera across the street at the Majestic Theater. Then, if we have the energy, we'll head down to Greenwich Village to check out the Halloween happenings there. It should be pretty exciting.